Today I would like to talk about Ebstein's Malformation of the Tricuspid Valve. One of the defects Abi was born with and which hasn't been corrected yet. We pray she will never need this corrected and will live full and long life without this every affecting her again. Ok, so what is Ebstein's Malformation of the Tricuspid Valve? Tricuspid valve is the inlet valve of the right ventircle that is built of 3 cusps (leaflets), hence the name tricuspid. This valve lets low-oxygenated blood from right atrium in to the right ventricle (right lower heart chamber). When this valve opens, the blood flows into the ventricle. 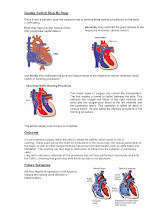 Then the valve closes, creating a perfect seal and blood is pumped out from the ventricle to lungs through pulmonary valve and pulmonary artery. 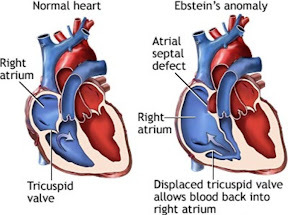 When the tricuspid valve is malformed or displaced it means it's located lower than usually and does not seal the ventricle properly, and then we talk about Ebstein's Malformation. In this case, the valve does not seal properly and low oxygenated blood leaks back to the right atrium. 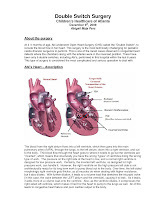 This causes atrium enlargement and leads to congestive heart failure (you will find the symptoms listed at the beginning of the Pulmonary Stenosis post from last week), and build up of fluid in the lungs. Ebstein's Malformation often is accompanied by ASD (Atrial Septal Defect, a whole between right and left atria, upper heart chambers). This causes the blue, oxygen depleted blood and the red, oxygenated blood to mix. This leads to poor oxygenation, low oxygen levels in the body. Depending on severity the condition may be left untreated and not affect the patient in any major way. It will have to be monitored though. If the condition is severe it may require surgical intervention, through an open heart surgery. The cardiothoracic surgeon may be able to fix the valve, reposition the leaflets or may need to replace the valve completely with a cow's or pig's tissue valve, called bioprosthesis. In Abi's case the valve is lowered and not fully closing causing some mild regurgitation. Before the Double Switch surgery it was working on the systemic side, performing left ventricle's job, pumping blood to the body at a much higher pressure. This led to much more severe regurgitation and caused multiple problems. Now, after Double Switch, it's back on the non-systemic side, working under much lower pressure. It is not leaking much, hence it's not affecting Abi in any way at the moment. It was too risky for Abi to attempt to fix it during the Double Switch surgery, so it was left intact then and, so far, seems like it was a good move.